Newport News Shipbuilding’s forklift ramp at Pier 3 becomes an interesting pathway in the harsh August light. Hassan Ahmed welds rungs to a ladder in the Sheet Metal Shop. Sunset over the Floating Dry Dock. 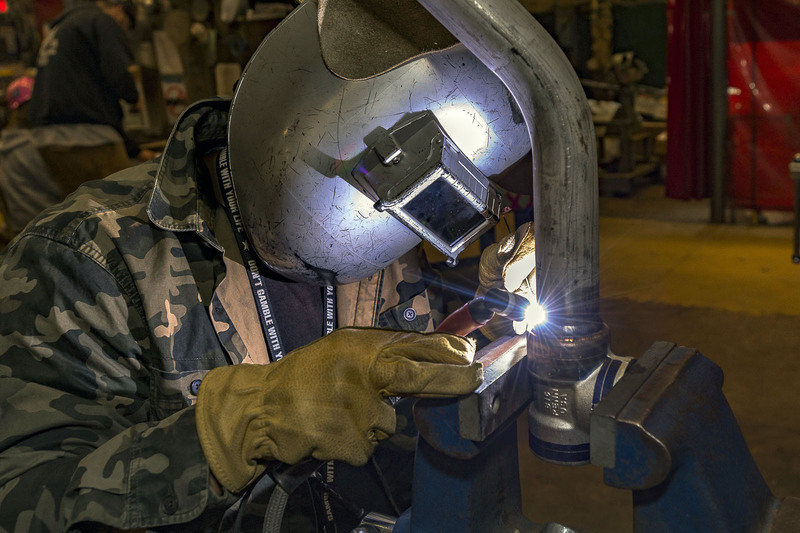 Jessie Lott adjusts a beveling torch that surrounds a submarine unit in the Ring Module Shop. Light from the evening sun illuminates a horn used as part of the company’s mass communication system. Alverse Stringfield grinds steel in the Covered Modular Assembly Facility. David Robinson verifies the flange is level after tacking it to the pipe’s tee. A craftsman slices through a piece of steel with a torch. Girders of Newport News Shipbuilding’s new 315-metric-ton Goliath gantry crane begin their 10 hour ascent into place. A shipbuilder’s shield is sprinkled with rain. The south leg of "Big Blue," the shipyard’s 1,050-metric-ton Goliath gantry crane, is reflected in rainwater after a storm. 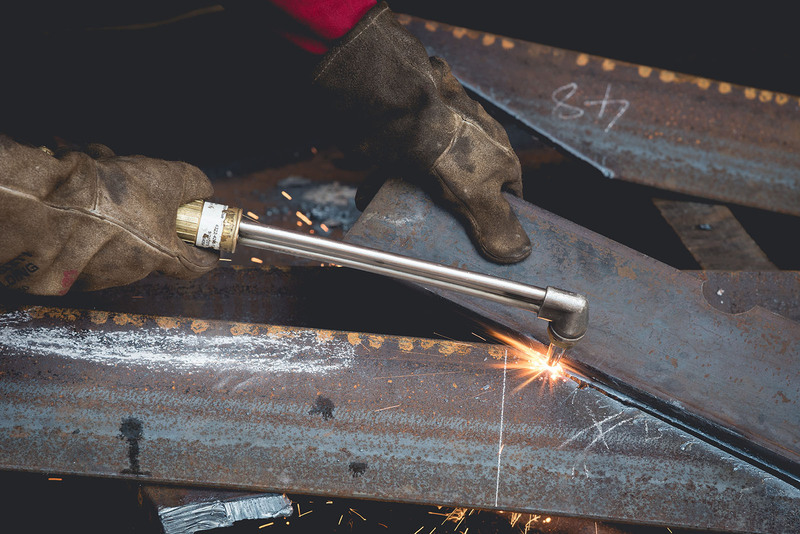 James Dillard performs hot work in the Steel Production Facility. NNS’ 1,050-ton Goliath gantry crane holds two John F. Kennedy (CVN 79) units in place as they are fitted together to form one large unit. David Jerkins performs tungsten inert gas (TIG) welding operations to weld a socketed tee to a pipe. Sunlight graces the side of a crane on a stormy day outside of the Covered Modular Outfitting Facility. Anchor chains rest in the forecastle of decommissioned Enterprise (CVN 65). Decommissioned aircraft carrier Enterprise (CVN 65) (left) floats next to Newport News Shipbuilding’s newest carrier USS Gerald R. Ford (CVN 78). Huntington Ingalls Industries Corporate Headquarters reside at the end of the rainbow.